December is off to a chaotic start to say the least, but luckily I’m only 2 weeks away from some much-needed downtime. It’s been helpful to lean on the holiday season to make my way through. Christmas music does wonders during chaos! LA had its first real bout of rain in ages this week. It’s been so long since we’ve had this much rain, that I’d completely forgotten how much my hair doesn’t like it! I’m willing to be a trooper about it though…in the name of our drought situation. I enjoy the rain – especially when it happens to arrive on a day that I can stay home and curl up with my Kindle or my Netflix queue and a cup of tea (as opposed to having to deal with the eternal nightmare that the 405 becomes until the roads dry again). The caveat to all of this, is that whenever it rains for more than a few days, I can also feel myself emotionally changing. Aside from my hair not being a fan of the rain, I also forget how much my body thrives on Vitamin D. It’s a stern reminder that I’m a total SoCal gal. If I don’t get some sun after a couple of days, I can feel my mood take a complete nosedive. As such, it pretty much solidifies that I won’t survive many other places in the world with actual weather. I’m stuck here. Unfortunately, the holidays have become a rough time of year for me as I’ve gotten older, but I do still try to channel as much of what makes this season special. Aside from Christmas music, it’s always helpful to head to The Grove to walk around marveling at how they transform a simple shopping center into a stunning holiday oasis (pictures don’t do the place justice). This was certainly a big highlight since we caught up last. Another highlight had to be a rainy Tuesday night in North Hollywood. If you’re looking for a great film out right now, I saw Whiplash earlier this week with a girlfriend and it blew my mind away. It’s aptly titled, given that you literally feel like you have a case of “Whiplash” when you leave the theater after following Andrew’s harrowing musical journey. It’s one of the most intense films I’ve seen in a while that stays with you days later. It will certainly be in my top 10 films of the year. Bravo to everyone involved! The weekend ahead will be low-key. I don’t have any plans as of writing time, and that’s a-okay with me. It’s official. Some light holiday decorating and a weekend filled with watching some of my favorite holiday movies and it’s beginning to look a lot like Christmas! I thought it would be fun to curate a list of some of my favorite Christmas songs – old and those that are destined to be new favorites. My two “go-to” Christmas CD’s have always been Mariah Carey’s Merry Christmas and Josh Groban’s Noel. There are also some great tracks on Celine Dion’s These Are The Special Times that are nostalgic to Christmas when I was a teen. To mix it up a bit, I decided to check out new releases from both Kelly Clarkson and Mary J. Blige. I have to say, I think Mary’s new holiday album, A Mary Christmas, will make it into rotation for years to come! And Kelly Clarkson’s Wrapped in Red has solid tracks that capture festivity in a fresh way. So let’s tame some of those chilly Monday Blues with a cup of hot cocoa and my Holiday Hits playlist. Just go ahead and log in to your Spotify account, hit play, sit back and relax, or get to work on those emails with this mix in the background perfect for bringing some holiday cheer! 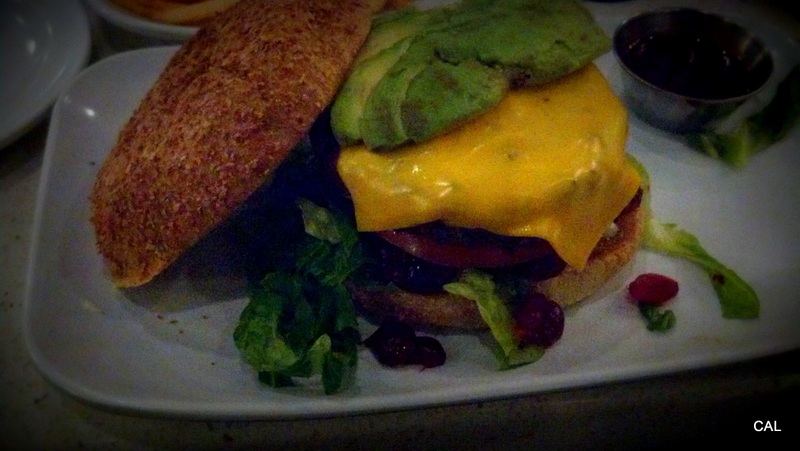 Posted in Dinner, Explore, Film, Food, Fun	by C.
A stop at The Counter for a custom-made burger and yummy fries last week before catching a flick over in Century City, had me try something different this time between the bun: cranberries! Let’s just say, it works. Yum! While I don’t personally have formal Christmas dinners, I would totally use these cute flatware stockings that I saw while perusing Crate and Barrel on my Holiday table. They’re so festive! 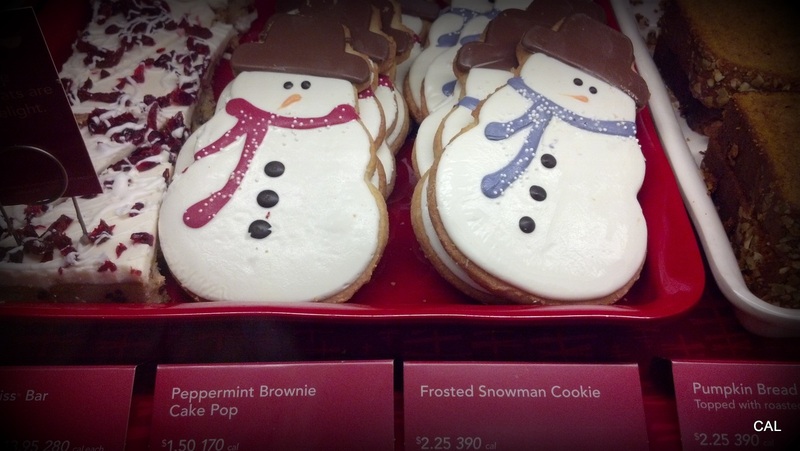 These adorable snowman cookies I saw while in line for a latte at Starbucks. The best part: the scarf! Christmas music has officially entered my life once again. My favorites: Josh Groban’s Noel, Mariah Carey’s Merry Christmas, and Pandora’s Christmas Station.